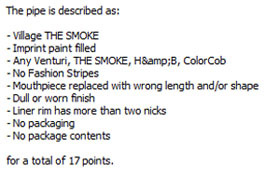 The value of pipe #784 is 17 points. Steve Landgraf (sland20196) auctioned a lot of twelve pipes on eBay - all made by SuperTemp Corporation. Half of them had been repainted by owners and all of them had been reconditioned by salt cleaning the bowls. Most of them have replacement mouthpieces. This one has been beautifully reconditioned: so well done, in fact, that it might easily be taken for a new pipe in near factory-fresh condition! Vanik Aloian decided to have it for his own.